"...do this in remembrance of me." 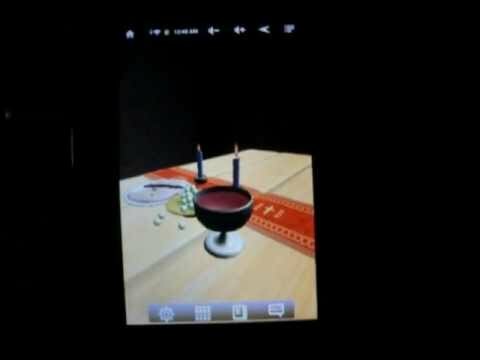 A Christian Holy Communion live wallpaper showing an attractive 3D candle light setting depicting our Lord's table. The view rotates bringing attention to the broken bread and the red wine. You can customize the table's wood, table runner, show metal or wood cup and plate and change the color of the grapes. The candle flicker provides a warm inviting environment to this communion scene. There is even a "low detail" option for slower devices. Copyright (c) 2012 Pixel Cube Software. IN NO EVENT SHALL PIXEL CUBE SOFTWARE BE LIABLE FOR ANY SPECIAL, INCIDENTAL, INDIRECT OR CONSEQUENTIAL DAMAGES OF ANY KIND, OR ANY DAMAGES WHATSOEVER RESULTING FROM LOSS OF USE, DATA OR PROFITS, WHETHER OR NOT ADVISED OF THE POSSIBILITY OF DAMAGE, AND ON ANY THEORY OF LIABILITY, ARISING OUT OF OR IN CONNECTION WITH THE USE OR PERFORMANCE OF THIS SOFTWARE.